Past to the Present, in a nutshell. “In 1609 Henry Hudson, in the service of the VOC, tried to find a northern passage to China. This Englishman, who had earned his spurs in trade with the Russians, already made two trips to the barren north. At last on his way to Nova Zembla, finally he found with his ship “De Halve Maen” (80 tons, 18 heads) the coast of North America. Due to this discovery of this part of America the river, a bay and a strait was named after him. Kiliaen of Rensselaer, a wealthy jeweller from Amsterdam and one of the founders of the W.I.C., bought a large piece of land west of the Hudson River in the vicinity of Fort Orange, the city of Albany. He bought it from the “MahyCans and Maquaas”. In 1637 he asked his nephew, Arendt van Curler to assist him on his extensive ranch “Rensselaer Wijck”. After seven years Van Curler, a descendant of a well known family in Nijkerk, returned to Holland. In 1647 he left Holland and started living in New Holland. The government gave him the rights to colonise a large area north of Fort Orange. 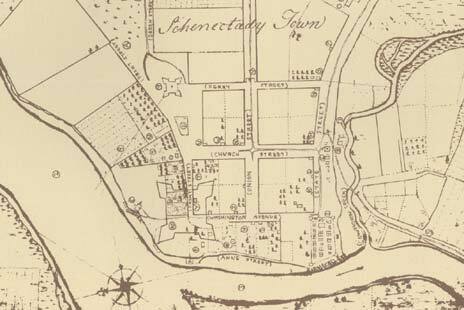 In 1662 he founded a settlement at the Mohawk River, which we now know as the city of Schenectady. In 1667 on his way to the governor of Canada, who had invited him, which was a very honourable invitation, he drowned in Lake Champlain. This person, the Nijkerker Arendt van Curler, is the reason for the link between Nijkerk and Schenectady. Map of Schenectady c. 1698, signed by Col.Wolfgang Romer. In the book “A Pocket Edition of Schenectady History” written by Larry Hart, city historian of Schenectady, the following can be read. The name Schenectady is very special. Recent history shows that this name was spelled 79 different ways until in early 1800 the current name was adopted. It is also strange that there is no other place in the world with the same name. It is assumed that the name Schenectady is derived from two denominations of the Iroquoi Indians: Scag-nac-ta-de, which means “over the plains of pine” (to Albany), or ‘quan-hac-ta-de, which means “next to the open door” (to the Mohawk Valley). 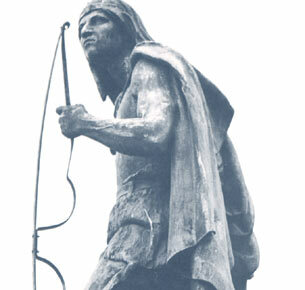 In the historic district of Schenectady, The Stockade, the statue of Lawrence the Indian can be seen. The settlement was founded by Arendt van Curler and 14 other Dutchmen, known as the Owners. In carts drawn by oxes they brought their families and valuable possessions on the pine-plains to start a new life, in an outpost walled by wooden poles, amid friendly Mohawk Indians. 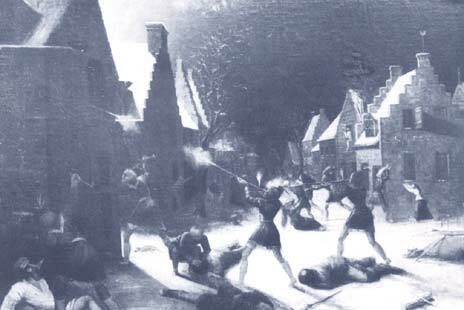 On the wintry night of February 8th 1690 about 200 French and the Indians attacked the unguarded Schenectady, burnt the houses and killed more than 60 of the inhabitants before they were heading for the north taking 30 prisoners, stolen goods and food. Those who escaped returned to the settlement and with the help of the Mohawk Indians, rebuild the settlement. The massacre of Schenectady, painting by Samuel H. Sexton. In 1797 the city of Schenectady obtained city rights, three years after the Union College (University) was founded. In the beginning Schenectady consisted of four districts, 2 city districtsand the towns of Rotterdam and Glenville as 3rd and 4th district. Schenectady now has fourteen city districts and the county (region) now includes the city, two villages and five municipalities. In 1822 Joseph C. Yates, the first mayor in 1798, in 1822 was the eighth Governor of the State of New York. So far Schenectady had 74 mayors. In 1983 Karen B. Johnson was the first elected female mayor. At the beginning of the 20th century, Schenectady inhabited groups from Europe and Africa. There was a time when every man had his own community and church, but slowly this phenomenon disappeared. As America became known as the “melting pot of the world”, Schenectady became the city with integrated nationalities.